A few months ago, Amber (Glamber) from Beauty Blogging Junkie and I spent a night having cosmos and chatting about the '70s (one of my favorite subjects.) Studio 54, disco balls, Cheryl Tiegs and of course Farrah Fawcett. I loved everything Farrah. The Noxema commercials with Joe Namath, the Ultrabrite commercials, THE swimsuit poster and Charlie's Angels. Being a fan from way back when... 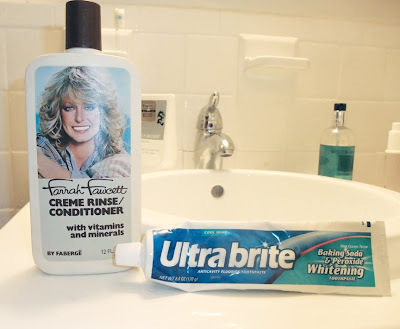 I bought Farrah Fawcett Shampoo and Creme Rinse/Conditioner as soon as it came out. I used all of the shampoo but I still have an unused bottle of her conditioner. I just opened it and had a wonderful surprise. It still has the original scent - a kind of mineraly, subtle perfumey aroma. 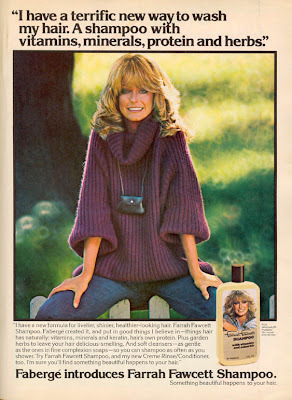 I imagine that's what her hair smelled like during her rise to super-stardom in the mid-70s. And by the by... my dentist still recommends Utrabrite toothpaste to me as one of the least abrasive and least expensive. I've been using it for years.